The texts started coming in on Saturday evening. "Have you seen Kylie Jenner's snaps of Stormi's birthday party ..........." my group chat buzzed. I hadn't—yet. "What's the theme?" I shot back. "StormiWorld," my friend said, almost instantly. That was all I needed to hear. 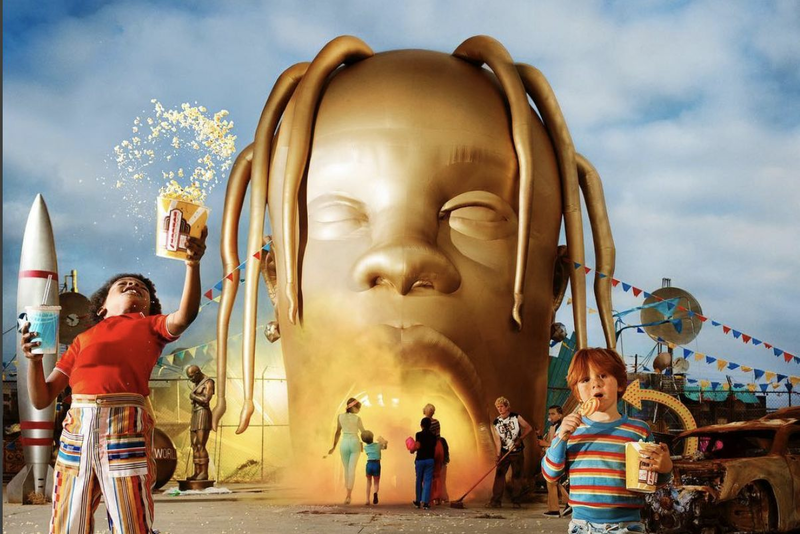 I wasted no time on my deep dive into the Travis Scott/Kylie Jenner web of association, desperate to experience what will surely be dubbed the Event of the Century—a 1-year-old's birthday party—from every perspective I could. I voraciously consumed the Snapchat and Instagram stories of Jordyn Woods, Khloe Kardashian, Stephanie Shepherd, Anastasia Karanikolaou—anyone and everyone who might earn a highly coveted spot on Stormi Webster's guest list. What I vicariously witnessed was nothing short of spectacular. Kylie Jenner, the 21-year-old billionaire, spared no expense to throw her infant daughter, who will surely not remember this occasion, an otherwise unforgettable celebration. At this point, you're probably wondering: why should I, a Houstonia reader and casual consumer of pop culture, care about this kid's party? The answer to that very question was actually revealed four paragraphs up. One (compound) word: StormiWorld. 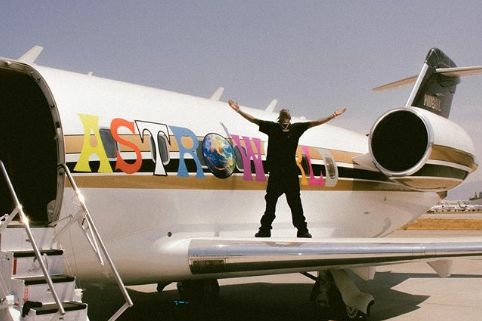 As in, AstroWorld. As in, Astroworld. From the slightly-terrifying-baby-head entrance to the rides to the merch, just about every part of baby Stormi's full-scale theme-park-turned-birthday party was an homage to her dad's Grammy-nominated album, subsequent tour, and inaugural hometown music festival. Albeit a girlier, toddler-friendly homage. If you missed it: There was the "rainbow butterfly forest" with winged fairy princesses; the rides and carnival games and prizes (rows upon rows of gigantic, pink and white teddy bears); the streamers and rainbow balloon arches and fluffy clouds; the bubble room; the glittering, towering cake shaped like a magical carousel. There were mini pizzas and piles of french fries in fast food-style containers covered in the famous Louis Vuitton logo with Stormi's initials in place of "LV." There were candy-colored drinks with outrageous krazy straws that twisted and looped to spell "STORMI." 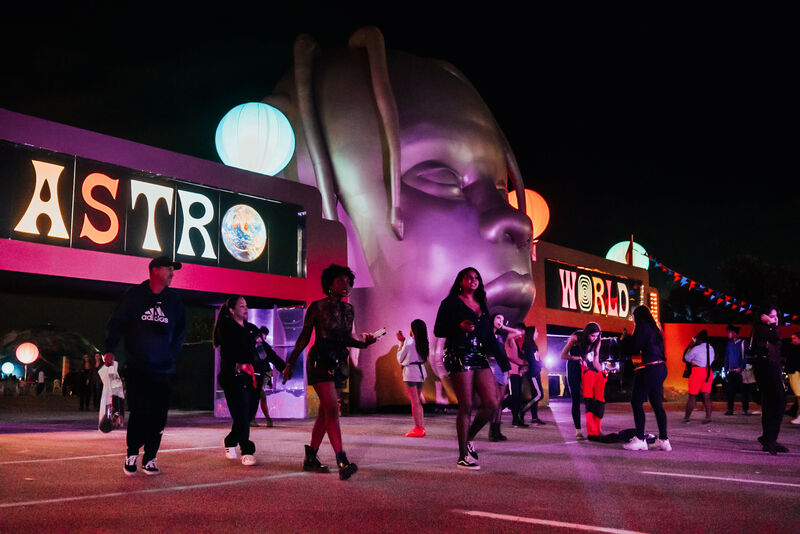 There was a full-on pop-up store selling "StormiWorld" apparel; baby-sized, tie-dyed sweatshirts designed to look like Travis Scott's tour merch right down to the "Wish You Were Here" motif. Clean versions of "Sicko Mode," "Wild Thoughts," and "HUMBLE" played. 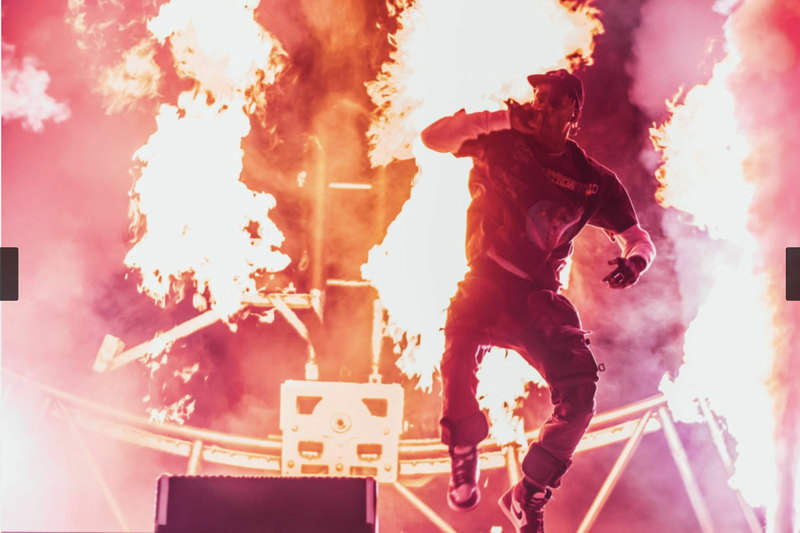 Later, a live "Baby Shark" performance spawned a highly shared, nauseatingly sweet video of Travis Scott in full dad mode, enthusiastically dancing to the viral children's sensation. All told, it put North West's backyard "Kidchella" (circa 2014) to shame. Everything—down to the pink, StormiWorld-emblazoned garbage cans—was branded, and really, would you expect anything less from a Kardashian? Love them or hate them, they know how to break the internet (Stormi's party was the top-trending item on Twitter before the Grammys this weekend), and we can say with certainty this is the first time we've ever pined for an invite from a toddler. We may not have been on the guest list, but we do have to take some of the credit: There would be no StormiWorld without Houston.